Vancouver’s film festival is past the half way mark, and I’m starting to get just a little tired of the arthouse precociousness that you get with a lot of the films that VIFF presents. We get it, you’re sad, and you’re important. Good for you. Because of all of the European misery I’ve been subjecting myself to, I was very much looking forward to seeing Benda Bilili! as I knew exactly what I was going to get: A documentary about one of the greatest musical success stories of the last decade. It’s the story of Ricky Likabu, a paraplegic musician living and working on the streets of Kinshasa, Congo. About six years ago, the film makers meet Ricky while working on another project in the Congo, and fall in love with him, and his music. They decide to try to help him and his group of musicians (Benda Bilili), to make a recording. They also introduce him to Roger Landu, a homeless street urchin from a surrounding village, who at that point was just starting to learn the satongé, a single-stringed instrument of his own devising. From a musical perspective Roger is the last missing ingredient to Benda Bilili’s unique stew of soukous, zouk, African rumba, and funk, but the band still struggles, and the film follows them around as they spend the next five years trying to make their dreams happen. This is a film full of joy, but it would be a mistake to call this a simple movie about music. What it’s really about, is following your dreams. Both Ricky and the film makers are trying to accomplish completely unrealistic goals, and the film follows both in a fairly straight-forward cinéma vérité style. 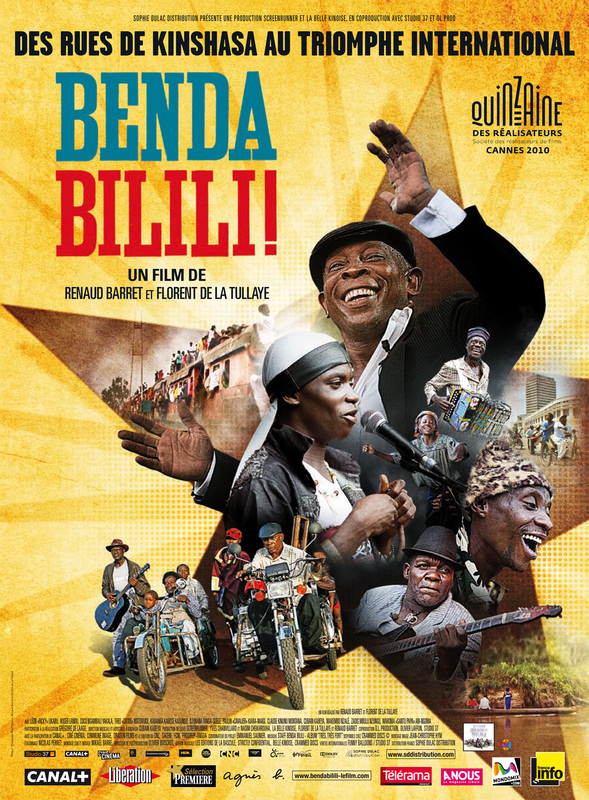 What I appreciated about Barret & de La Tullaye’s approach was that even though they are a fairly integral part to Bilili’s story, they really kept themselves out of the film, and even minimized the involvement of producer Vincent Kunis in the movie, even though his arrival in Kinshasa really changed the fortunes of the band. What the film makers do, and do well, is to keep the camera on the band. Half of the members of the group are physically disabled in some way due to polio, and so it’s easy to dismiss them as a simple gimmick group. But as the movie eventually shows when the group makes its inevitable performance debut in France, they’re anything but. I should know, I’m one of the few people in this country that’s been lucky enough to have seen them. Benda Bilili is a straight-forward rags to riches story. But it’s also a good film. And one that recognizes that Staff Benda Bilili isn’t worth watching because they’re from the Congo, or because they live in a zoo, or because they have polio. They’re worth watching because they are one of the best live bands on the planet right now, and it’s a tragedy that due to visa and passport problems, that this film might be North American audiences only chance to see them. Although the film does have it’s minor problems (a lack of real explanation as to exactly how successful the band becomes, no interviews with any band members other than Landu or Likabu), it’s still a very watchable documentary, and one of the best music films I’ve seen in some time. This entry was posted in Movies and tagged Benda Bilili, Movies, Staff Benda Bilili, VIFF. Bookmark the permalink.